Candlewick Press, 2008. 56 pages. However, along comes an extremely persistent mouse, small and gray and bright-eyed. This mouse thwarts all of Bear's plans to keep him out. The result? 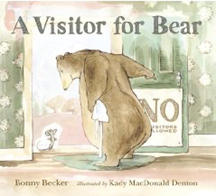 Bear learns that maybe visitors aren't so bad after all. The story is simple, but the execution is exquisite! The expressions on the faces of Bear and the mouse are delightful, beautifully conveying Bear's anger, surprise, resignation, and eventual delight. This is a fabulous Story Time selection, as the repetition gets the kids wondering where the mouse will pop up next. I've already tried the book out on three classes of third graders, with great success, and I think it will do equally well with preschoolers. This book is simply delightful.